Your customers will receive email notifications (confirmation and reminders) if they have been configured. Once your bookable team member enters their email into the Notification section, they will also receive these notifications. 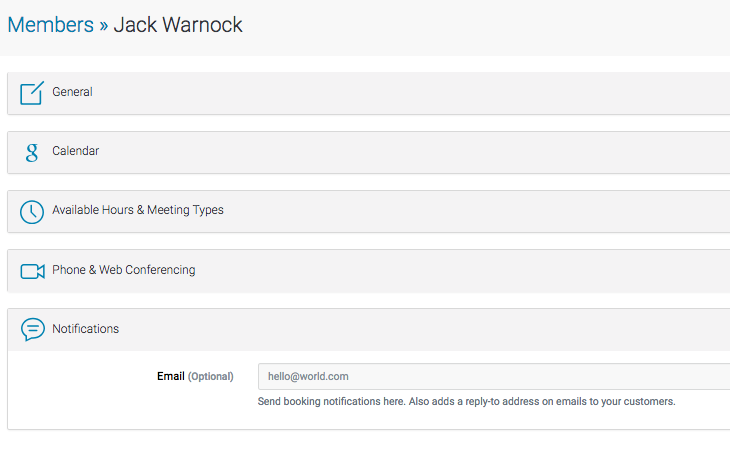 Once you've set up your Confirmation and Reminder emails on a meeting type, Appointlet gives you the added option of making those email notifications appear to come from your email address. This means that when people receive the message in their inbox, they can reply and reach you directly. Simply navigate to your member name, open the Notifications section and enter your name in the Email field. Save these changes by clicking the green button in the upper right hand corner.